I'll give you the bad news up front: these ideas only work this easily on the Kalimar Reflex, which is not the best Medium Format SLR ever made. 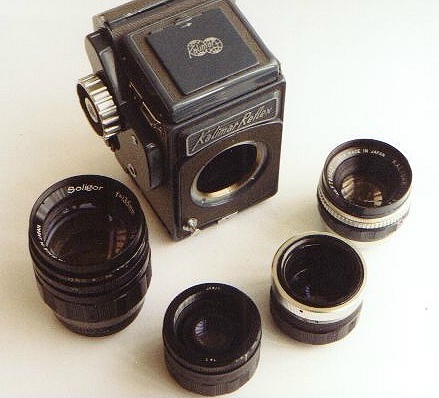 The GOOD news, though, is that it's certainly one of the CHEAPEST Medium Format SLRs ever made, and it had a pretty decent range of lenses that can be adapted to other cameras. I've made 2 adapters for the Kalimar, both built out of cheap 1.5x teleconverters in the Miranda mount. 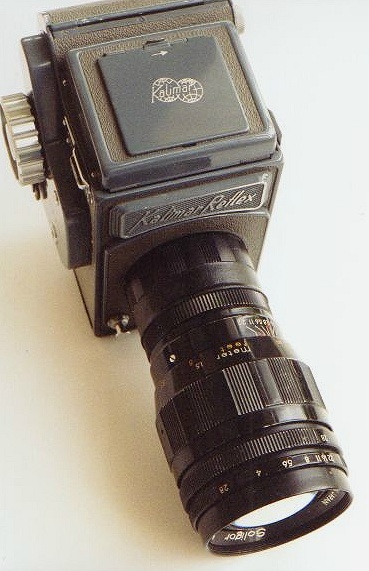 Both take advantage of the fact that the Kalimar's M44 x .75 lens mount thread is nearly identical to the M44 x 1.0 of the Miranda 35mm cameras. 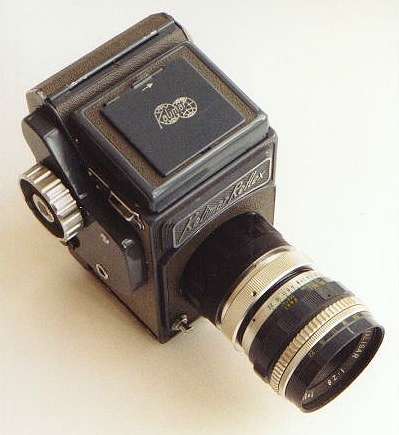 A small amount of lapping with an abrasive compound will make them compatible (the aluminum of the accessory wears much faster than the chrome plated brass of the camera mount, so you don't ruin the camera in the process). 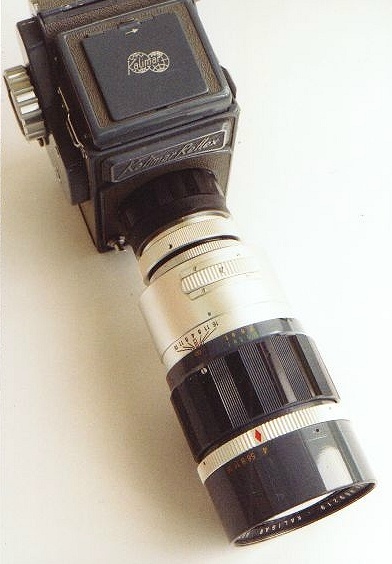 The second homemade accessory is a conventional 2x teleconverter, for use with any of the Kalimar-mount medium format lenses. This was trickier, because I had to come up with an M44 x .75 female thread to attach the lens to on the front. Hunting through my junk drawer, I was shocked to discover that this is nearly IDENTICAL to the thread in a Series 6 filter ring! I now use these as rear lens caps, in addition to the one I used in the teleconverter. Here again, you have to move the lens cell in the Miranda teleconverter to obtain correct infinity focus; but this time you have to shift the glass to the rear rather than to the front. Luckily, the lens cells in these are mounted on a simple thread and are easily shifted forward and back in the barrel. Left to right: a T-mount Soligor 135/2.8 lens, a 2.5x T-adapter, a 2x teleconverter, and the normal 80/2.8 Kaligar lens. And here they are as assembled on the camera, giving 338/7 and 160/5.6 respectively. .... and the Big Guns: the 240/4.0 on the teleconverter (of course, the REALLY big gun is a 400mm on the 2.5x T-adapter). Adapt All These to your Pentacon Six!